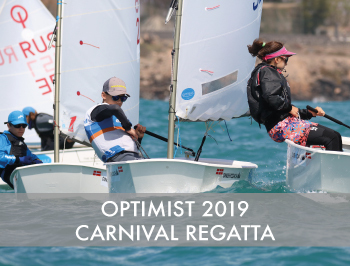 Optimist – Carnival Regatta 2019 | Dinghycoach 15 Feb: Racing day 1 16 Feb: Racing day 2 17 Feb: Racing day 3 Schedule Friday 15 Feb 09.30h Skippers Briefing 10.30h Launching 11.30h 1st Warning signal – 4 Races back to back Schedule Saturday 16 Feb 9.00h Skippers Briefing 10.00h Launching 11.00h 1st Warning signal – 4 Races back to back. Schedule Sunday 17 Feb 9.00h Skippers Briefing 10.00h Launching 11.00h 1st Warning signal – 4 Races back to back. Aditional information: Notice Of Race and Sailing Instructions will be send by e-mail to participants after registration. Limited charter boats are available. you can book them on this page Pricing Option 1: Regatta registration fee € 75,- excl. 7% IGIC/VAT Option 2: Regatta registration fee Incl. Charter boat €210,- excl. 7% IGIC/VAT What is included? Option 1: -Regatta entry Option 2: - Regatta entry - Boat charter - 1x lunchpack per day - video briefing / de-briefing Accommodation Accommodation is not included in the registration fee for the regatta. Sailors get a choice to book the clinic including accommodation to stay at our hotel or excluding accommodation and arrange their accommodation in a villa through us or elsewhere by yourself. During our intensive training camps we will get quality hours on the water covering all aspects of sailboat racing. NOTE: This year Dinghycoach, Sailing Events Management S.L. & Marina Rubicon are organizing a Carnival regatta on 15,16 & 17 February 2019. Carnival Clinic 2 is the clinic prior to the regatta, Carlinal Clinic 3 is the clinic after the regatta so we combine high level training with racing in great conditions! 11.00h 1st Warning signal – 4 Races back to back. Notice Of Race and Sailing Instructions will be send by e-mail to participants after registration. Accommodation is not included in the registration fee for the regatta. For additional parents and or siblings we offer a deal to stay in the same hotel as the sailors for €49 ex VAT per night incl. breakfast/dinner. Airport transfers are only provided for sailors that are traveling alone or groups that have made special arrangements by e-mail with Diego. What should I bring if I booked a charter boat?